To ensure that your gleaming white conservatory remains immaculate, it's essential that you regularly clean and maintain it. Otherwise, you are at risk of an unsightly green deposit (a combination of lichen and moss) developing on it over time. As well as cleaning your conservatory glass, we can also protect the frames, ridge detailing and decorative plastic uPVC. 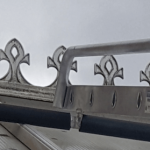 We carefully access the cresting and finials using a conservatory ladder. We then perform a pre-wash using a hand brush before applying cream cleaner for a glistening white finish. 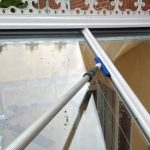 An alternative, more cost-effective option is to pressure wash the detailing, however, this will be discussed once we have inspected your conservatory. We also examine your sills and gutters, washing away the dirt from the draining channels around doors and windows, as well as removing any moss with a detail brush. This keeps the rubber seals water-tight. We can clean the interior glass of your conservatory, including the roof. We can apply Patination oil to lead, preventing it from leaching onto the glass. 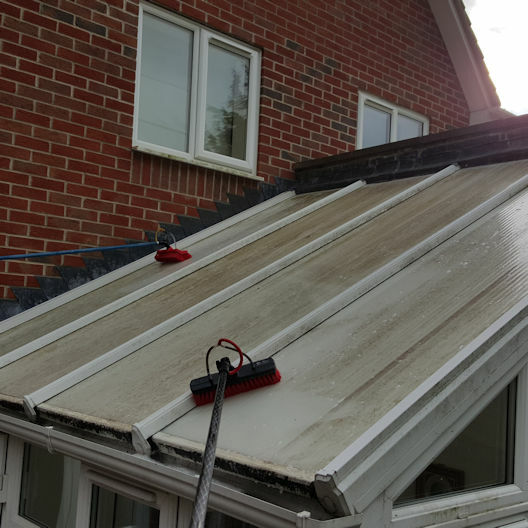 If we notice that an end cap has come loose or a gutter has popped out of place, we’ll be more than happy to take care of it while cleaning your conservatory. We want to make sure that your conservatory stays in optimum condition, and these additional benefits are all part of providing an exceptional service for our customers. When cleaning your conservatory, we don't leave any corner untouched. These are the four steps of the process we use to get your conservatory looking as good as new. Step One: A pre-soak to loosen any debris and prevent rogue stones from scratching the glass during the cleaning process. Step Two: A hot soap pre-wash. Step Three: A heavy rinse using cold water to eliminate excess soap. Step Four: Finally, we finish with a pure water wash. Whether you're looking for a one-off clean or a regular service on your conservatory, get in touch to find out more!